For more than a dozen years Tom Sheppard has coached and helped people to get and keep the job they want. He has done this through résumé preparation, cover letter preparation, job search consulting and interview coaching. In his corporate life, he has been trained in targeted selection interviewing techniques and he has interviewed and hired people for many different positions over the years. It is not uncommon for him to go through résumés of nearly 100 people, and to interview a dozen or more people, all while looking to fill one job. He has leveraged his training and experience on the hiring side of the table (evaluating résumés and cover letters, and interviewing job candidates) to help those on the job-seeking side. He has provided outplacement training for a Fortune 500 company when they were laying off employees, teaching groups of employees what they needed to know, while providing one-on-one assistance for many of those same employees. 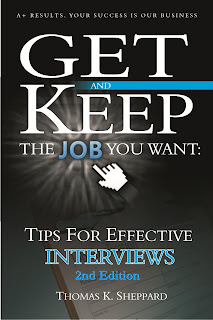 Tom is the author of several books to help job seekers. All are available as eBooks and some are also available in paperback.